Even though I dislike all the renumbering Marvel does, I’m a sucker for their manufactured milestone issues. While I’m not a huge fan of the title character, last Wednesday’s Wolverine #300 was another fun read from another aggregated landmark. Jason Aaron and a team of artists bring a big story that includes the return of a major Wolverine villain, a new path for another, and a new Silver Samurai along with most of Logan’s Japan-based supporting cast. Aaron has said this will be his last arc on Wolverine (though he’ll still write the character in the pages of Wolverine and the X-Men) and he’s clearly planning to go big before going home. 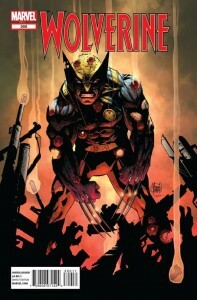 Spoilers for Wolverine #300 will follow. This week not only saw the release of Marvel’s Incredible Hulk #600 but Amazing Spider-Man #600 as well. It looks like I made a poor decision in what to read on Wednesday (especially considering I only had time to read one book). While Hulk #600 had more problems than I care to recall, Amazing #600 was truly amazing. Featuring a massive 104 pages of new material, this book was well worth its $4.99 price tag. 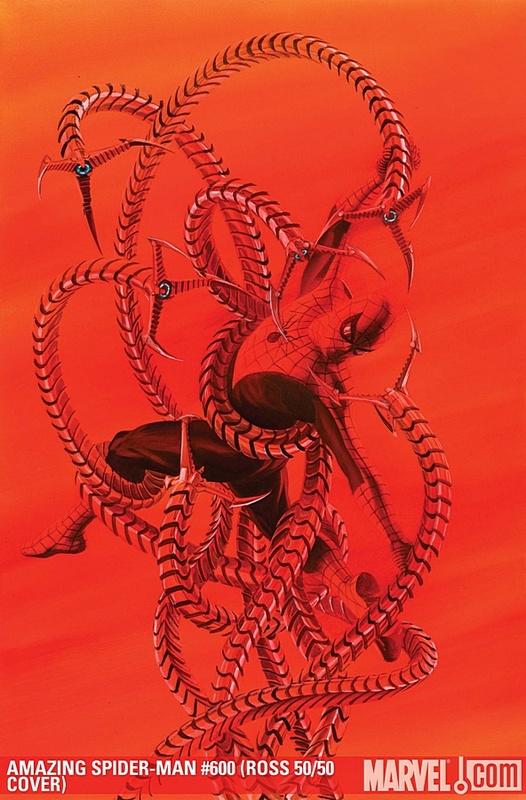 The feature story by Dan Slott and John Romita Jr. told a tale of a frail and aging Doctor Octopus trying to leave his legacy to the world. Of course, this was a gift the people of New York were wishing they could return as it all goes wrong and chaos ensues. Set against the back drop of Aunt May’s wedding to John Jameson Sr. (J. Jonah Jameson’s father) Spider-Man has even more motivation to save the day. This is a great story for an anniversary issue as it has an epic quality to it while being very much set in current Spidey continuity. Some plotlines are wrapped up and a number of new ones are set in motion. The artwork is top notch and it’s the kind of story that could have been spread over three regular sized issues. 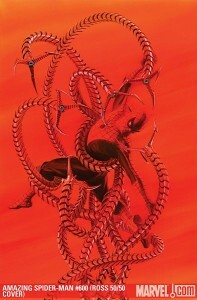 The rest of the book consists of short stories including: Spider-Man’s trip to a psychiatrist by Stan Lee and Marcos Martin, and a museum by Zeb Wells and Derec Donovan; a couple of touching stories featuring Uncle Ben by Mark Waid and Colleen Doran, and Aunt May by Marc Guggenheim and Mitch Breitweiser; “If I Was Spider-Man” by Bob Gale and Mario Alberti where some kids in a playground daydream about what it would be like to be Spidey; and a final story featuring Madame Web sets things in motion for the Spidey event the Gauntlet continuing throughout the year in Amazing Spider-Man. Between the pages of each of these stories are series of “Spider-Man covers you’ll never see” that were good for a laugh. All in all, I can’t say enough good things about this book. I’m reading Amazing Spider-Man on a regular basis and this was really satisfying both as an issue that fits right into ongoing events and as an event itself. Today saw the release of Incredible Hulk #600, another landmark issue in the year of Marvel‘s fuzzy math 70th Anniversary. The dodgy addition is in full effect for this Hulk issue as well since I can’t make heads or tails of how this is issue 600. According to my research (Wikipedia), Hulk was featured in Tales to Astonish from issue 60 through 101. At this point, the series was renamed Incredible Hulk and ran to issue 474. The title was relaunched (as were a number of Marvel books at the time) with a new #1 and ran through issue 112. This is where (and Kevin loved this) the title became Incredible Hercules. 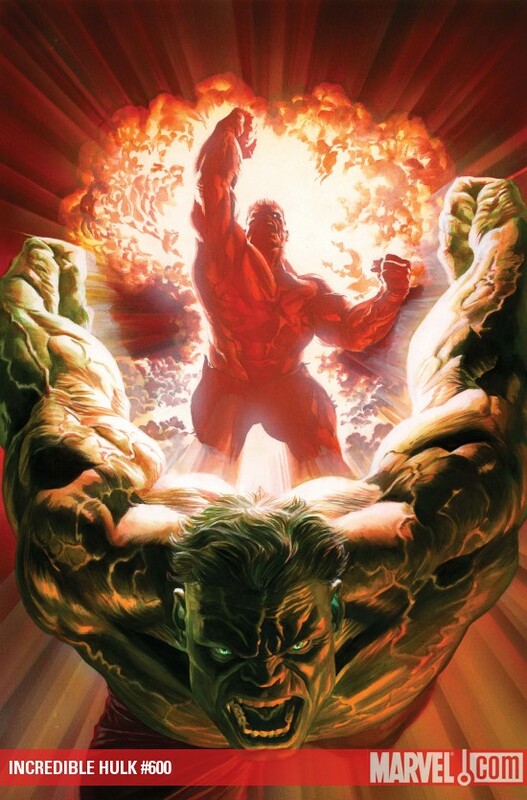 The final days of the Incredible Hulk title saw the Hulk’s journey to an alien world in Planet Hulk when the Illuminati decided to protect the Earth by sending the Hulk away, and his eventual return for vengeance in World War Hulk. Despite the success of these stories by writer Greg Pak, Marvel mysteriously handed the Hulk over to Jeph Loeb for a new series with a another issue #1, that was and is God awful. This book reached issue #12 last month and has focused entirely on another mystery in the identity of a new Red Hulk (called Rulk, see, God awful). Adding it up we have 101 issues of Tales to Astonish, 373 issues of Incredible Hulk (102-474) volume 1, 112 issues of Incredible Hulk volume 2, and 12 issues of God awful Hulk. So, they’re off by 1! No, they aren’t because you have to include Incredible Hulk -1 from Marvel’s Minus One Month in 1997. 599..therefore, this is issue 600. 1. The original 1962 Hulk series by Stan Lee and Jack Kirby ran from issue 1 to 6. Wouldn’t that make this issue 606? 2. Hulk wasn’t featured in Tales to Astonish 1-59. Wouldn’t that make this issue 541? or 547? Almost forgot the issue review, we’re still not told the identity of Red Hulk, we get a reprint of Hulk: Gray #1, two fun Chris Giarusso stories (featuring Green, Red and Blue Hulks), and an intriguing She-Hulk story featuring someone who’s not any She-Hulk I’m familiar with and is apparently Bruce Banner’s daughter from the future. I did not feel this was worth the $4.99 price tag and I’m not even sure it’s issue 600. Incredible Hulk was returning with issue 600 followed by future issues written by Greg Pak, Jeph Loeb’s God awful Hulk book would continue with issue 13, Skaar Son of Hulk would continue without Skaar, and Incredible Hercules would not be affected in any way. Kevin: I don’t even know what to make of this. Or if I even want to read it, what I need to do to catch up. What a nightmare. Pete: I think you can ignore Herc, obviously. I can lend you all of the remaining Skaar issues leading up to 600. I’m stopping that book at issue 12. I think we can ignore Loeb’s Hulk. The only real story is “who is the Red Hulk?” so, I think at that point you could start with Hulk 600 and go on from there. I’ll be getting at least issue 600 (since it fills in between WWH and Loeb’s Hulk #1) and 601 (just to see what Pak has planned). I will not be getting any of Loeb’s Hulk issues. It is a nightmare, but I trust Pak. I know you didn’t dig Planet Hulk so much, but I really enjoyed his run and World War Hulk for the most part. Easily, the best since the Peter David stuff. Kevin: Yeah I really liked World War Hulk. Planet Hulk not so much. Pete: I think Pak back on Incredible Hulk is absolutely worth checking out. I have my doubts that Loeb and Pak had all of this worked out at the beginning though. I just feel like Pak would have reacted differently when we asked him about the transition and encouraged us to keep reading. Kevin: Yeah that’s what I thought when I read that comment yesterday. When we saw him at NYCC he had no future Hulk plans in place. Pete: This post is now 700 words.